New living room furniture in 2019! 8 Bedrooms (4K/Bath ,2Q, P, 2B) 6.5 total Baths. New Carpet in bedrooms in 2018. One 50" TV upstairs with a Blue Ray DVD Player, one 42' TV downstairs and another 42' TV in the main King Master Suite, 32' Flat screen TV's in each of the King Master bedrooms. There is also TV in each and every room. Four master bedrooms, a game room with pool table, Playstation, wireless internet, computer, pool (with heater) and hot tub are but a few of the amenities provided for your enjoyment. Our home is on the 'Ocean side' of Route 12, and is only a short walk to the beach access. Sheets and bath towels provided. Our home is child friendly, and all furniture is strapped to the wall for your child's protection. Pack and Play (2), high chair, stroller, baby gate, and other necessities for children provided for your convenience. The lower level has a game room with new pool table and electronics, a queen bedroom, a bedroom with two bunk beds, a full bath and a full size washer and dryer. The middle level features three king bedrooms with private a bath, a queen bedroom, a pyramid bedroom and a full bath. The upper level has a large open living area and a half bath. 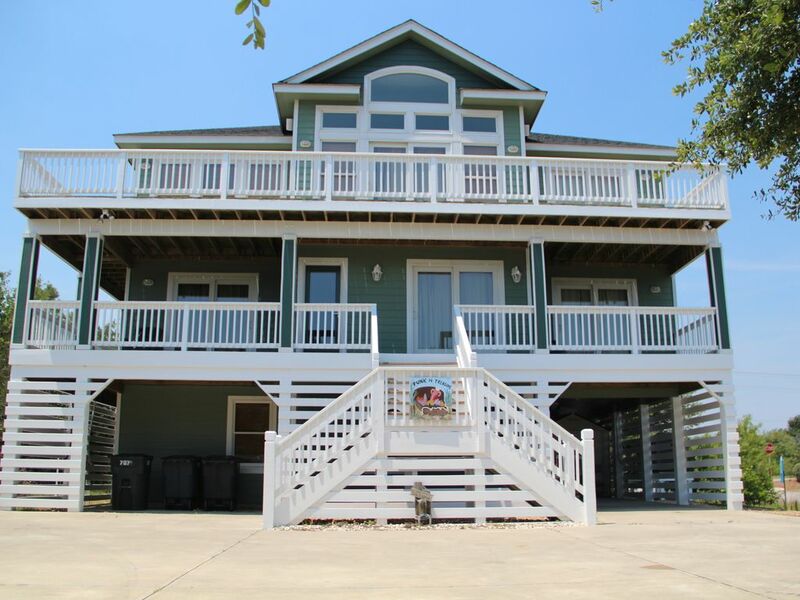 There is a fully equipped kitchen with 2 dishwashers and a bar refrigerator under the island. The dining table seats ten and there is room for five at the bar. There is also a king master bedroom with a soaking tub and separate shower. Our home is laid out perfectly for those traveling with multiple couples, large families. The bedrooms are such that each person can have as much or as little privacy as they would want. One regular size refrigerator and one beverage size refrigerator in the kitchen... another beverage size refrigerator in th game room. ~Includes 2 dishwashers and an additional beverage refrigerator~ There is also a beverage refrigerator on the bottom level in the rec room. ~With picnic tables and plenty of lawn chairs! Pool is Heated (Heater automatically comes on when outside temperature reaches 50 degrees) Pool is available Mid April to Mid October. Our home comes with the furniture strapped. For those with young children, this is a must have safety feature. www.maddiesmessage.com to learn more about strapping furniture. thought the traffic noise may be a problem but it wasn't at all, in fact, the pool area was very private from the other houses as the kids were in the pool till late at night with music, and we didn't bother the neighbors as it is also surrounded by trees. We found a road that led us onto the beach where the horses are and had one four wheel vehicle which had to make trips to bring groups of us onto the beach, but worth it to beach there for a day and experience the horses. Much better than paying a ton of money for the tour. We really enjoyed our stay and would do it again. The house is everything a family could want or need! We loved the space, the pool & hot tub & all the extras. The walk to the beach was not too bad - well worth it as the beach is beautiful! House was beautiful. Very roomy. Plenty of room. Plenty of towels. Liked all of the kitchen utensils. Pool was relaxing. Everything was clean. Owner was accessible. Really enjoyed our time there. The house was an awesome size to accommodate our large family. There were a few things that needed attention. The tree in the driveway scarped the roof of our car each time we went in and out. Not cool. The furniture in the living room was very worn and needs replacing. The cushions were so worn our bottoms almost hit the floor. In the kitchen we did love the 2 dishwasher, because it made clean up a snap. On the down side, there was a draw full of knives but not one of them was sharp enough to cut anything. Same goes for the frying pans. They were all really beat dented and burned everything. It seems like guests keep buying and leaving things in the kitchen but nothing is ever sorted or discarded when worn out. Maybe they do that at the end of the season. The decks were beautiful for sitting but the furniture was sparse. Only 4 chairs and nothing else. Also one of the people in our group got poison ivy when they went over the pool fence to retrieve a ball, so be careful. We have stayed in a lot of places and for the price I was expecting things to be a little bit better taken care of. We really enjoyed the large kitchen and the patio/pool area. It met all of our needs and was in a pretty convenient location. Nice home, needs some tlc but overall had everything we needed! A bit too far from beach and a lot of noise from busy road while by the pool.